In the streets of Tijuana there is still blood running and it seems to have no end. 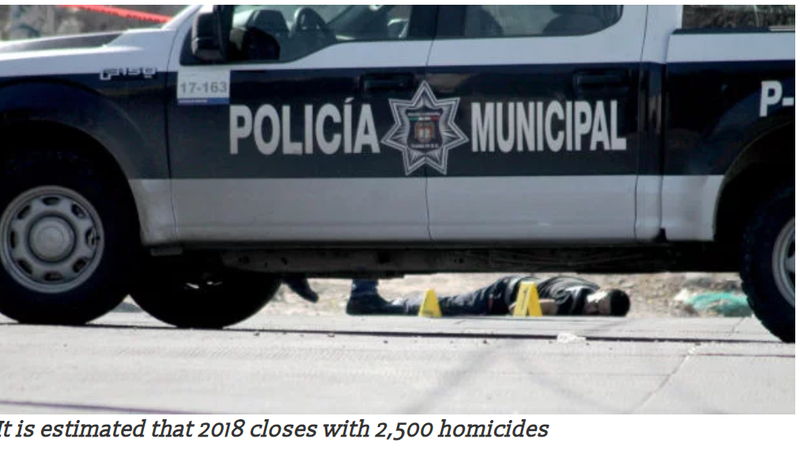 Projections by the Attorney General of the State (PGJE) estimate that the year 2018 will close with around 2,500 dead, a historical figure for Baja California. 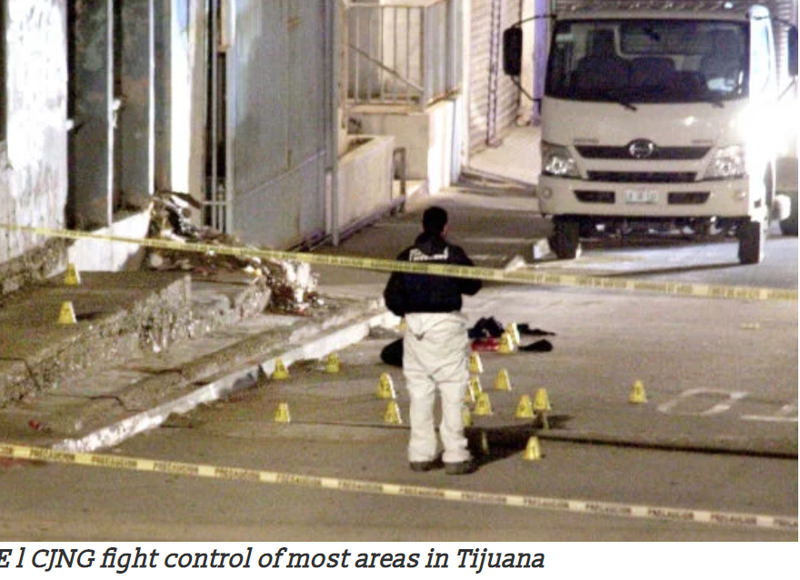 64% of the crimes in Tijuana have been committed in delegations such as Los Pinos, La Presa, Centro, Sanchez Taboada and San Antonio de los Buenos, where there is a struggle for the control of the plazas for the sale of drugs between members of the Jalisco Nueva Generación Cartel and of Sinaloa Cartel. To gain ground, CJNG sells larger doses of crystal meth ( ice ) for the same price, which raised an indiscriminate war. Between the leaders of cells that bring in check to the authority they emphasize Jose Luis Mendoza Armenta ,"El Güero Chompas", Edgar Alejandro Herrera Pardo "El Cayman", Rodolfo López Arellano "El Cabo 30" and Iván Leonardo Peña Peralta "ElTurbo". The battle between the cells of the cartels for the control of the sale of drugs increases the statistics of homicides, which up to the end of the edition, accounted for 2, 083 victims. Intentional crimes have been recorded more frequently in the delegations Los Pinos, La Presa, Centro, Sánchez Taboada and San Antonio de los Buenos. Only in those points, so far this year has been deprived of life to one thousand 443 people, 64 percent of all murders committed on this border. 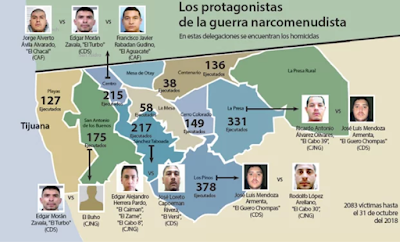 In the war between the Sinaloa (CDS) and Jalisco Nueva Generación (CJNG) cartels, the authority has identified two groups that remain leaders among the hitmen and are in constant dispute over the sale and distribution of narcotics. The Arellano Félix Cartel (CAF), Los Aquiles and Los Chapitos, maintain dispute only in the Central Zone of Tijuana. In other areas, the CAF maintains alliances with the CJNG, although investigators report a distancing between these criminal groups, which could worsen the atmosphere of insecurity, which is already in serious alert. According to information obtained by ZETA , the strategy that the CJNG has been using for months to gain ground to Los Aquiles in the drug trade issue, consists of selling meth in larger doses for the same price. "One dose has a market value of 50 pesos. What Jalisco is doing is offering larger doses for the same price, in order to grab more ''shooters'' and customers. Almost giving away the drug. Although Sinaloa pays its vendors better , they often change sides and that is when the war between narcomenudistas comes, " said a source consulted by this Weekly. In the Los Pinos delegation those who squabble in the streets are: José Luis Mendoza Armenta ,"El Güero Chompas", from the Sinaloa Cartel, against Rodolfo López Arellano "El Cabo 30". In La Presa, the same "Güero Chompas" and Ricardo Antonio Álvarez Olivares "El Cabo 39", of the CJNG, compete. In Sanchez Taboada the territory is disputed by José Loreto Capoeman Rivera "El Versi", of Sinaloa, against Edgar Alejandro Herrera Pardo "El Caimán", "El Zame" and / or "El Cabo 8", of Jalisco Nueva Generación. In the Central Zone, it is Jorge Alberto Ávila Alvarado "El Chacal" (CAF) against Edgar Morán Zavala "El Turbo", from Sinaloa, and Francisco Javier Rabadán Gudiño ,"Aguacate" prevail. In San Antonio de los Buenos it is , "El Turbo" of Sinaloa and "El Búho" by CJNG. 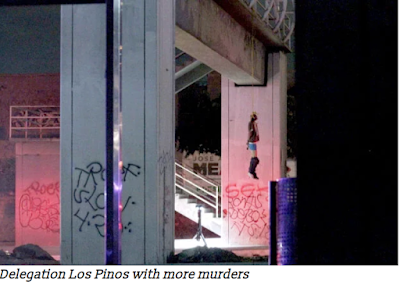 Los Pinos is the area most fought over by narcomenudistas and where there are more murders. Criminally it is led by "El Güero Chompas" (Sinaloa) and "El Cabo 30" (CJNG). The area includes around 13 residential complexes among which are Los Pinos, Villas de Baja California, Villas de Alcázar, Delicias 1, 2 and 3; Hacienda Los Venados, Villas del Campo, Natura, Ke Casas and Los Valles. "The attractiveness of this area and why they fight for control, is that it is an extensive territory, densely populated and low resources. There are a lot of captive consumers, because the opportunities are very limited for social and human and economic development. Few parks, small houses; it is a good market for drug traffickers, " said one source. As if that was not enough, he added, there is an absence of the police authorities. The remoteness of the place makes it a no-man's land. "Practically, in those places they are fighting privately against private. In one street there is a leader of tienditas , ie ''little stores'' and in the other street the opposite. They are pushing against each other. " Up until the end of the edition, in Los Pinos there were 378 crimes in the course of 2018. 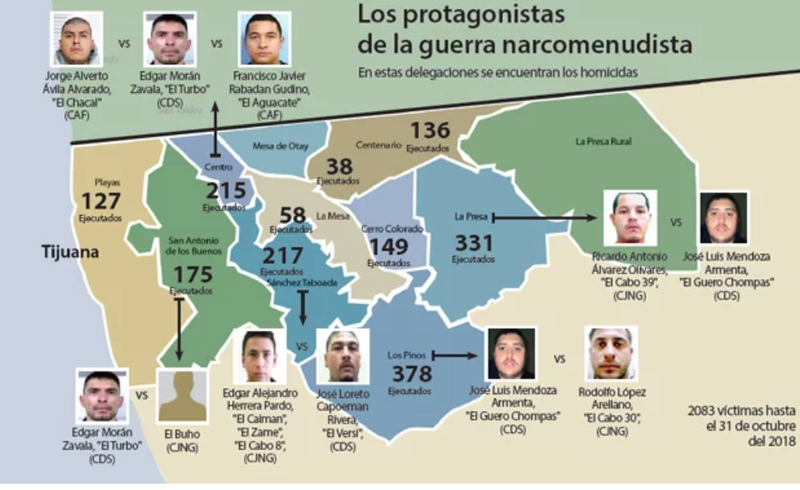 As of Thursday, November 1,217 victims have been deprived of their lives, mostly on the orders of José Loreto Capoeman Rivera, "El Versi", of the Sinaloa Cartel, who disputes the area with Edgar Alejandro Herrera Pardo "El Caimán "," El Zame "and / or" El Cabo 8 ", of Jalisco. According to information provided to ZETA by reliable sources, "El Caimán", 38 years old, is the leader of assassins. Its criminal group is made up of young people between 16 and 30 years old, who are dedicated to find and execute opposing narcomenudistas and thus gain ground for the Sinaloa Cartel. "In June an internal struggle began between the self-styled ''Los Cabos'', attached to Jalisco (CJNG) between ''El Cabo 8'' and against David López Jiménez ''Cabo 20'' or ''El Lobo'', the latter is a dissident of the Jalisco Cartel for to form an alliance with some members of the CAF for the transfer of drugs to the United States, initiating an internal struggle that in this case is headed by Herrera Pardo, " commented a member of the Coordination Group. 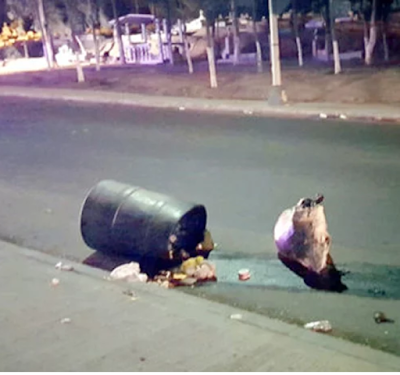 While "El Versi" of 32 years, responsible for drug dealing in the area, is part of the group "Los Chapitos" of CDS and maintains a fierce fight against "El Cabo 8". "The Sanchez Taboada is the bastion of CJNG, that's where the cartel was born as a branch of Jalisco. There lived the pioneers of the group such as Juan José Pérez Vargas ''El Piolín'', Arturo Gómez Herrera, ''El Gross'' (assassinated in Jalisco), Erick Deraz González, ''El Güero Canesten'' (riddled to death in Tijuana) and "Los Cabos". The first problem among them is that one of the sectors that had traditionally controlled Sinaloa, which is the Colonia Camino Verde , intended to take over Jalisco, that's when the struggle for the territory begins, " the source confided. Five years ago, when the CJNG began to have influence in Tijuana, it was precisely when "El Piolín" was detained in the La Mesa Penitentiary. "When he leaves Cereso, they connected him with someone important in Jalisco. They gave him a lot of power and they told him that they occupied influence in the city, but since they could not send money they sent them drugs, a part was even given away and another was financed, for that reason Tijuana was flooded with drugs. ''there is so much going for you to hire people, buy drugs, weapons, corrupt authorities''. The challenge was to take away the Arellano Félix's power, " said the researcher. The dispute over the area is due to the rivalry between José Luis Mendoza Armenta, "El Güero Chompas" and Ricardo Antonio Álvarez Olivares ,"El Cabo 39", of the Sinaloa and Jalisco New Generation cartels, respectively. 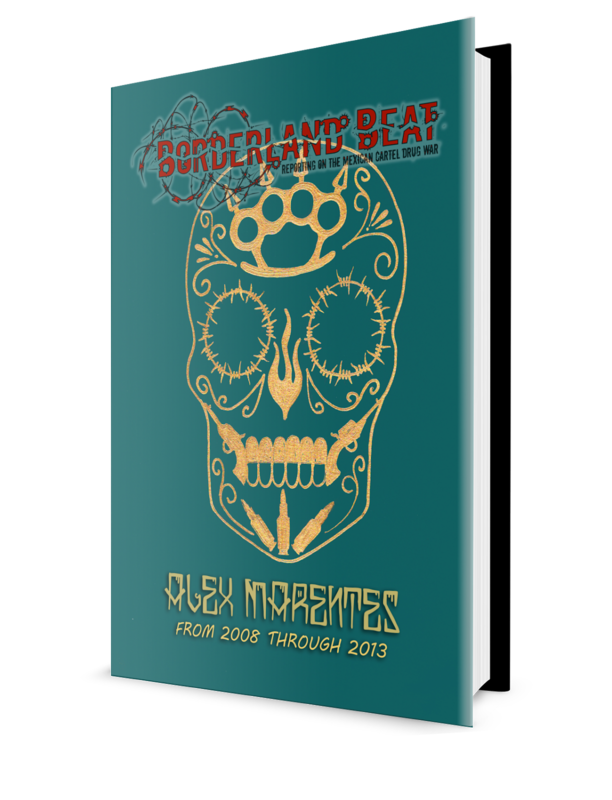 The hit men on both sides recorded 331 victims in colonies such as Ejido Francisco Villa, Las Fuentes, Mariano Matamoros, El Florido, Terrazas del Valle and El Dorado Residencial. Data from intelligence groups indicate that Mendoza Armenta is the leader of the "Los Chapitos" cell, who has maintained a criminal war against the CJNG for preserving control of the East Zone. Edgar Morán Zavala, "El Turbo", aligned with the Sinaloa Cartel, is in charge of the fight for that territory against, "El Búho", although his real name is unknown. Among the records and statements of detainees, is outlined as a male between 40 and 45 years, obese with dark complexion; belonging to CJNG. The zones in conflict are: Pedregal of Santa Julia, Obrera, Founders, Summits of Juárez, Loma Bonita and Guadalajara. At the close of the edition, 175 fatalities were recorded in 2018. So far this year, it has counted 215 victims. This demarcation is disputed by three cartels under the command of Jorge Alberto Avila Alvarado ,"El Chacal" (CAF), against "El Turbo" (Sinaloa) and "El Aguacate" (Los Aquiles). Intelligence sources mention that the downtown area is a tourist attraction, having commercial stores, bars, hotels, food businesses; coupled with the high influx of people and constant economic flow. Until November 1, the Central Zone is located as the fifth delegation with the highest levels of incidence of homicides. The dispute is mainly between members of the "Los Monos" group (CJNG) and "Los Turbos" (Sinaloa). Data from the Citizen Council of Independent Organizations, indicate that in 2017 there were about 10,000 slot machines distributed in Central or North Zone and the East Zone. The "mini casinos" are disguised as grocery stores, internet cafes or pharmacies, and are frequented by criminals for the distribution of drugs. These are controlled by Luis Arturo Cosme Espinoza ,"El Cosme", of the CAF. District 1: Otay Mesa, Sánchez Taboada, Cerro Colorado and part of the Central Zone, where the group or cartel led by Alfonso Arteaga García ,"El Aquiles", and his brother René, alias "La Rana", has been identified as a zone of operation. Reliable sources indicate that the control of the cartel is carried by the latter, ceded by "El Aquiles". Since 2015, this group has been fighting for the control of the square against "Los Uriarte", and on the other hand, against the associated groups of the CAF and CJNG and / or CTNG. Its area of ​​operation is Otay Mesa, where narcomenudistas are present in the rest of the aforementioned delegations. District 2: Includes La Presa, Rural Dam and Cerro Colorado. According to official and unofficial interviews, Luis Alberto López Uriarte ,"El Pájaro", predominates in this zone, who has a dispute with the Uriarte brothers and with "Los Aquiles", CAF and CTNG. District 3: It is made up of Los Pinos, Cerro Colorado, La Presa and Sánchez Taboada. The criminal group headed by the Uriarte brothers -Francisco Javier and José Luis Mendoza Uriarte-, both in dispute over the control of drug dealing with "Los Aquiles" , "El Pájaro" and CAF-CTNG, operates. District 4: Abarca , Sánchez Taboada, Los Pinos and San Antonio de los Buenos, Playas de Tijuana and Zona Centro. They operate associated criminal groups (CAF-CTNG-CJNG), in dispute over the control of drug dealing with people from "Los Aquiles", the "Pájaro" and "Los Uriarte". Hermanos Arteaga: Alfonso Arteaga García "El Aquiles" and René Arteaga García "La Rana". Under his command they integrate the criminal group: Sergio Arturo Andrade Magallanes, "El Checo", Rodolfo Alberto Moreno Gaeta, "El Chaparro", Edgar Alejandro Simón Delgado ,"El Chilango", or "El Chilas"; Roberto Carlos Carbajal Castillo ,"El Charly" -reflected in the Cereso-. Cristian Adrián Ceciliano Cortés ,"El Pipián", and Marcos David García Lozada ,"El Mangue" or "Manguerísimo". CTNG and CJNG: Cell led by Edgar Alejandro Herrera Pardo ,"El Caimán", "El Zame" or "Cabo 8", under his orders operate: Juan Hernández Quintero ,"El Juan Tortas", who has an active arrest warrant for homicide ; Francisco Javier Gómez Hernández or Miguel Ángel Gómez Hernández; Israel Alejandro Vázquez Vázquez ,"El 50" or "El Goofy"; Giovanni Ruanova Pantiga ,"El Koreano", Daniel Misael Murillo Gastélum, "El Miclo", Manuel Santiago Navarro Silva, "El Minimí", the last three, prisoners in the Social Readaptation Center. 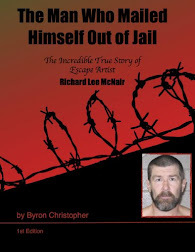 In the Eastern Zone of the Los Cabos Group, they point to Rodolfo López Arellano ,"Solecito" or "El Cabo 30", as chief hitman. Among the gunmen are: Elix Guadalupe Valdez Alcaraz ,"El Lupillo", 23 years old; Carlos Lorenzo Hinojosa Guerrero ,"El Hacker" or "El Cabo 96", of 28; Cristian Jonathan López Saenz ,El Jona", 22; and Ricardo Antonio Álvarez Olivares ,"El Bebé" or "El Cabo 39", aged 28, with an active arrest warrant for breach of family obligations. "El Pájaro": Luis Alberto López Uriarte, brother of Raydel Rosalío López Uriarte ,"El Muletas". Hermanos Uriarte: (Sinaloa Cartel) Francisco Javier "Chapito Uriarte" and José Luis Mendoza Uriarte ,"Güero Chompas", in charge of narcomenudeo in Sánchez Taboada; José Loreto Capoeman Rivera ,"El Versi", financial operator (payroll); Rogelio Sebastián Osuna Leyva, "El Wara" or "El Jerson", leader of hired assassins and charge of flat; Luis Alberto García Meza ,"El Güicho" and Rubén Manuel Ríos Hernández ,"El Niño", who has an arrest warrant for robbery with violence and narcomenudeo. In addition to Christian Israel Jordán Salazar ,"El Travieso" and Ramón Daniel Orozco Rodríguez ,"El Junior". CAF: According to intelligence sources, the Arellano Félix Cartel retains its own structure and only shares certain areas of Tijuana to operate the Jalisco and Tijuana Nueva Generación cartels. According to the authorities, the CAF is led by Pablo Edwin Huerta Nuño ,"El Flaco", whose criminal cell is integrated by Luis Roberto Toscano Torres ,"El Monito" or "Luiyi"; Guillermo González Camarillo ,"El Pelón"; Alberto Ávila Alvarado ,"El Chacal"; as well as Ladislao Antonio, Roberto Carlos and Marcos Rafael (assassinated), the three, with last names Toscano Rodríguez. "What is the main reason that Tijuana is a violent city? "The answer is that there is a presence of violent criminal structures that are dedicated to the transfer of drugs in large quantities. Tijuana is one of the three main plazas, there is a well-armed structure from the protection of authorities, to an effective method of crossing drugs such as tunnels and crossing by sentry boxes in double-bottom vehicles. " 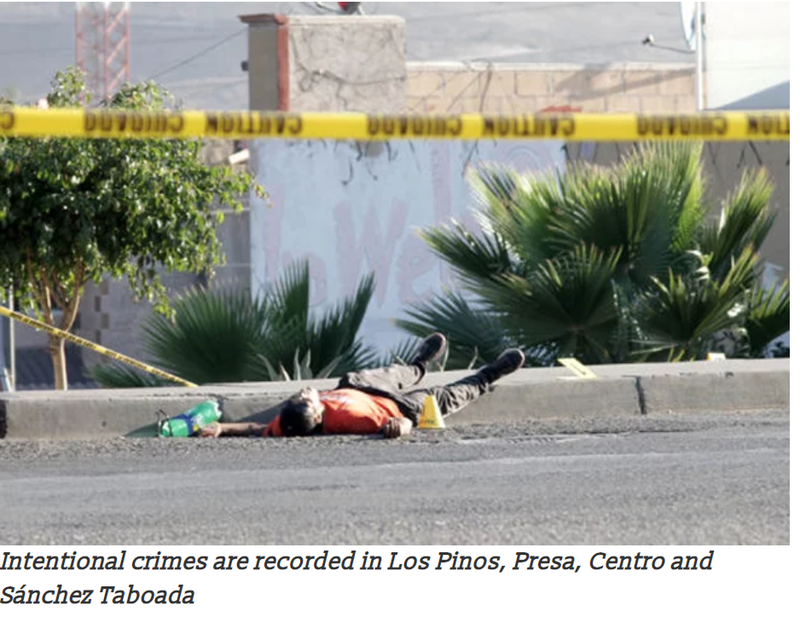 The State Preventive Police (PEP) registers an increase in the number of intentional homicides and attributes it mainly to the dispute that has drug cartels accentuated in Baja California, which maintain a fight for the control of the plaza for the distribution and sale of drugs. "The work dynamics on the part of the cartels, which previously focused their activity on the transfer of drugs, now seek internal distribution for street drug trafficking purposes, being a profitable business for them due to the high level of drug use that exists in the city, which also affects the increase in crime rates, " he concluded. The struggle initiated by the CJNG against Sinaloa is caused mainly by the fight for control of Sanchez Taboada, La Presa, Los Pinos, La Presa Rural and Zona Centro delegations, discarding the San Antonio de los Buenos demarcation. "The situation has led to constant executions and a war without respect for the laws of engagement, because in these delegations the population index is higher and represents an attractive market for drug dealing," it was reported. To conclude, the respondent explained that starting in 2015, the CJNG initiated a recruitment of active leaders belonging to opposing groups, in order to take advantage of their positioning and control of zones, in addition to executing mid-level managers to weaken the cells that operated for other cartels, which has led to an increase in cases of homicides due to account adjustments, or changes in drug dealing structures. Note: For those of you with photographic memories: There will be a Pop Quiz coming up. Cjng is defenetly gaining more ground, they have a better recruiting strategy. Not to mention their sicarios are so effective that their enemies fear them and rather switch sides. Most of the ctng is made up of CAF and CDS chapulines. It's defenetly worse than when el teo and el posolero were disappearing bodies. Love the pop quiz. People tend to forget what they read. I doubt most read the complete articles.. lol just saying..
Over here, we deal with just fine. I beg to differ. The Teo vs Inge war had a VERY large body count. Not to mention in that war both guys were heavy hitters. Teo was essentially going against the boss. These guys aren't on the same criminal level as inge or tres letras, they're street corner guys. Having said all of that, it still doesn't change the fact that they're making Tijuana hell on earth once again. No mention of el griego. I thought he was a right under aquiles and the frog. 1:17 doesnt it get old spamming Chapo snitched blah blah? Get a life homie wow. Pop quiz?? Lol this is fun. A question for anyone with any sense of the situation. Is this war in Tijuana actually about local drug sales on the Mexican side or a cartel territory war for the plaza to send drugs to the US? Or both? If it’s both how come the cartels can’t get the local dealers in check? Seems like a very impossible complicated situation but if anyone on here can elaborate please do so. lol “thank me later” like you just said anything that’s not already known. The body count you're seeing is the result of street corner guys killing each other. Yes like you said its impossible to keep street corner guys in line because they're the most likely to switch flags on you. The big dawgs are crossing work thru tj business as usual. Caf sold their soul and let a foreign invader in their territory without a fight. If caf was a country we would call that an invasion. CAF let a foreign invader in their territory? Uh CAF was started by Sinaloenses. Tijuana has a hard time accepting this fact. Tijuana was never Tijuana's, Sinaloa has deep roots in that city. Way deeper than any pop up shop cartel that you hear about nowadays. Tijuana got invaded by sinaloas but now michoacanos are in the mix. Those michoacanos are ruthless, el teo was working for CDs and la familia michoacana (most ruthless at the time) was backing him up.. it's been said that al two switched to work for la familia but got captured and their plan backfired. Michoacanos have been in Tijuana for the longest and never paid taxes to CAF.. that's the reason now cjng is after that plaza, even though cds had their back at one point but still tried to tax them to cross through their plaza. I remember years back there was narcomantas in Tijuana that read "bamos a matar a todos los michoacanos que no quieren pagar piso" now michoacanos have that plaza due to caf and cds trying to tax them.. just saying..
5:25 Sinaloas at it again this is the main difference between CJNG and Sinaloas la Nueva doesn't need to send their own people to Baja they make agreements and pacts with the locals to fly their falg and sell their product. Rana and akiles have no support and mayo anymore. They’re on their own now. They will fall soon. I would fail the pop quiz. But 2500 murders expected for 2018! That's more than the population of my entire town! Wonder how many of those were innocent bystanders? People caught in the crossfire, mistaken identity, family members of drug dealers...just to fight over neighborhood drug sales to poison your own people. Crazy!